Updated: Thursday, April 4, 2019. 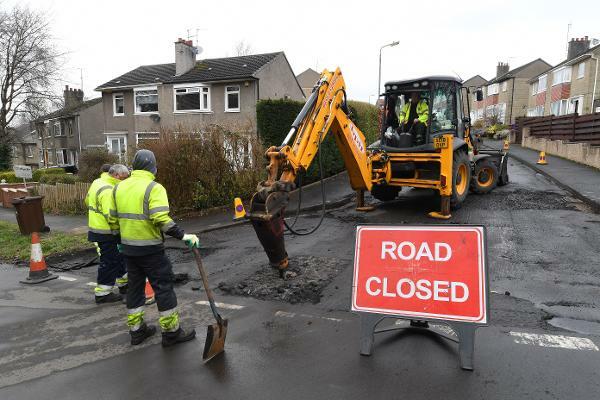 A new system of roads maintenance in Glasgow will focus on permanent repairs to potholes and other roads defects at the first time of asking. The new approach, based on careful risk assessments of individual roads defects, will signal a substantial reduction in the current practice of temporary patching, which costs the council around £1m each year. Temporary repairs can help to address immediate road safety concerns, but this method can lead to defects requiring to be patched on numerous occasions before more substantial work can be organised. By shifting the emphasis of roads maintenance to first-time permanent repairs, it is anticipated there will be long term improvements to the condition of the road network, but also a far more efficient use of resources. Taking a risk-based approach to how roads maintenance resources are allocated will also help to ensure that the defects which create the greatest danger to roads users are treated as the highest priority. Councillor Anna Richardson, City Convener for Sustainability and Carbon Reduction, is fully behind the new approach. She said: "Temporary patching has its place and will continue to be necessary in certain circumstances. But unfortunately temporary repairs have become discredited because they can deteriorate quickly and then need to be re-done repeatedly. This gives the impression that resources are being wasted and staff are doing a poor job. "Moving to a system of first time permanent repairs will ensure that the work on fixing defects is high quality and durable. It's estimated that focusing on first time permanent repairs will reduce the number of temporary patches by up to 75% and that means we will be spending our money more wisely and effectively. "This approach will see funds otherwise used for temporary patches reinvested in first time permanent repairs and that can only benefit roads users in the long term. First time repairs will also have the added benefit of cutting back on the amount of asphalt used by the council, which is good for the city's carbon footprint." The risk based approach to road inspections and repairs come directly from national guidance developed by the Society of Chief Officers for Transportation in Scotland (SCOTS), which is made up of roads professionals from all 32 local authorities and seven regional transport partnerships. The guidance has already been adopted by other local authorities across Scotland and the council has now approved the new policy following agreement at the City Administration Committee. This followed a previous recommendation to approve the policy from the Environment, Sustainability and Carbon Reduction Policy Committee. A risk based approach is a major move away from previous methods, which relied upon prescriptive definitions of a defect regardless of its context. The proposed revised policy includes a risk assessment which allows a defect to be analysed within the context which it exists. Using a risk matrix to evaluate the hazards in terms of likelihood and potential consequences, the risk posed by the defect can be objectively categorised and then appropriately dealt with. More information can be found in the committee paper put before the City Administration Committee on April 4, 2019.